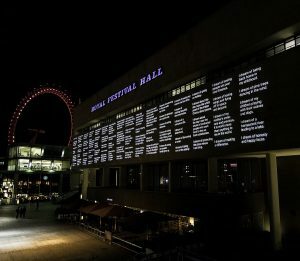 Wall of Dreams was a large-scale visual projection onto Royal Festival Hall, produced for the launch of Southbank Centre’s Poetry International and London Literature Festivals. The Wall of Dreams is an enormous collective poem written with the dreams of refugees, and was feature as the visual narrative for the festival. Dreams are wishes, hopes and visions for the future, formulated so that each one begins with “I dream…”. Every dream acts as a window into people’s thoughts as while they are on the move or trying to settle in a new place. To write something on a wall is a special thing to do. We say “The writing on the wall” meaning what is true or inevitable. Posters, announcements and warnings are often put on walls. This vertical writing is different from the writing found in books. It speaks with another voice. It is louder and speaks with more authority. The dreams was be projected onto the walls of the Royal Festival Hall at the Southbank Centre using high-intensity light projections. A simple but strong gesture: words from people that are seeking refuge, gave others the opportunity to take notice and so give agency to them. The dreams was collected in collaboration with the Southbank Centre and poets Jasmine Ann Cooray and Kayo Chingonyi and the activist Naja Ashley Misfeldt, from refugees and migrants currently living in the U.K., Greece, France, Germany and Denmark. The project created a dynamic and strong energy from its participants. 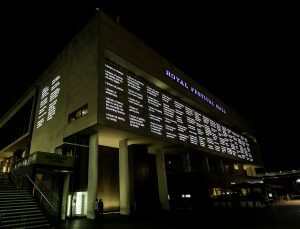 A total of 550 dreams was projected onto the Royal Festival Hall across three weeks from the opening of Poetry International and London Literature Festivals 2017. The range of participants spans from Syria, Afghanistan, Sudan, Guinea, Eritrea, Somalia and many other counties. As described in the current media, refugees and migrants are an indistinguishable mass and viewed as an ‘other’ in society. This artwork and project was an opportunity to effect a change in this representation. The intention of the Wall of Dreams was to convey a different narrative. A dream is an aspiration. It provides a glimpse of a person and a culture from within, and without judgment. By focusing on dreams, we focus on the dignity and pride of each person. Something from within shines out, just like the dreams that was projected onto the surface of the building. The dreams formed a collective poem written by people from all over the world in the same situation. The Wall of Dreams was an inclusive gesture, not a confrontational one. People on the move seek shelter, welcoming walls and roofs for protection. The Wall of Dreams offered a common and uniting image that focuses on the universal. Dreams and aspirations that we all have, and which bind us together as human beings. When an individual meets another, something new happens and it often helps to erase prejudices. People who are hostile to strangers in the mass, rarely have the same attitude to those who work in the shop around the corner. When we meet people face to face, stereotypical thinking often goes away. When we hear each other’s dreams, empathy is unavoidable. The voices found on the Wall of Dreams are all very different. They are a multitude and yet each voice represents an individual. It is a sharing wall, an inclusive wall, a connective interface, that we hope will make an original contribution to the debate on how Europe should respond to its refugee crises. Thanks to these organisations: Help Refugees, London, UK, Refugee Youth, London, UK, Women for Refugee Women, London, UK, Nomad, London, UK, CARAS, London, UK, Alkyone day center, Greece, Arsis, Greece, Intervolve, Softex Refugee Camp, Thessaloniki, Greece, Jafra R2R, Greece, Khora community centre, Greece, Melissa Network, Athen, Greece, Lesvos solidarity, Pikpa camp, Lesvos, Greece, Swiss Cross, Lesvos, Greece, Drop in the ocean, Skaramangas camp, Athens, Greece, Refugees at Louisiana Art Museum Humlebæk, Denmark, Refugees at SIK Sprogcenteret in Kalundborg, Denmark, refugees in and around Paris, France, refugees at Lampedusa, Italy. Thanks to Lars Sidenius, Bea Colley, Lizzie Wait, Egle Banelyte, Jérémy Ristord, Anna Maria Orrù and a special thanks to Naja Ashley Misfeldt. Arts Foundation, The Royal Danish Embassy London and SGM Lights and is based on an artwork by Morten Søndergaard.